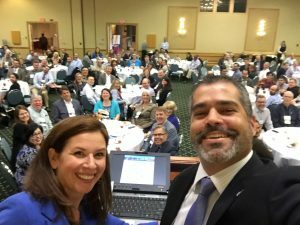 The University of Delaware’s Martha Narvaez, passed the presidential gavel in Orlando Florida at the 2016 American Water Resource Association (AWRA) Annual Conference held November 13-16 in Orlando, Florida. The incoming president will be Rafael Frias, III, Client Director, Global Water Business, Black and Veatch, Coral Springs, Florida. Narvaez served her term in 2016 as the 51st president of the Association. While serving as president Narvaez helped to achieve several goals of the Association. This year, AWRA successfully restructured its membership, a result of a multi-year effort. AWRA increased the number of webinars offered and AWRA hosted 10 webinars while continuing to host their hallmark annual (Orlando, Florida) and specialty conferences (Anchorage, Alaska and Sacramento, California). The Association led its second annual AWRA National Leadership Institute for State Leaders. AWRA has also transitioned IMPACT, the Association’s bimonthly magazine, to an exciting new format through the hard work and dedication of the staff and board members creating a valuable water resources publication. One of Narvaez’s top priorities for this year was to strengthen the relationship between the national association and state sections. With the support of many board members AWRA has been represented at numerous state section meetings and continues to strengthen those state section relationships. While serving as President, Narvaez attended state section meetings in North Carolina, Delaware, Montana, Georgia, Alaska and the Mid-Atlantic sections at the 2016 AWRA Mid-Atlantic Conference in Wilmington, Delaware. Martha will serve as Past-President for AWRA in 2017. Narvaez is a policy scientist with the University’s Water Resource Center in the Institute for Public Administration and School of Public Policy and Administration, and has also served as founding president of the Delaware state chapter of the AWRA and co-founder of the UD student section of the AWRA. ​Established in 1964, the AWRA has over 2,100 members and has sponsored 120 symposia over the last 52 years in the U.S. and abroad with over 30,000 attendees. AWRA publishes the Journal of the American Water Resources Association (JAWRA) with an impact factor ranking in the upper third of peer publications. The Delaware Water Resource Center is one of the 54 National Institutes for Water Resources (NIWR) supported by the U.S. Department of Interior at land grant universities in the 50 states, District of Columbia, and the island territories of Guam, Puerto Rico and the U.S. Virgin Islands.